Phytoplankton play an important role in regulating short-term variability in carbonate chemistry, including changes related to coastal acidification. 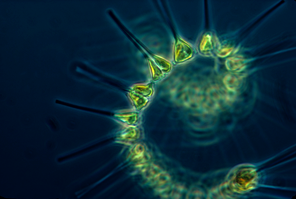 At the same time, phytoplankton are affected by coastal acidification, potentially affecting the many types of marine life that eat phytoplankton. Many fish, whales, shellfish, and other species of socioeconomic importance in the New England/Nova Scotia region rely directly and/or indirectly on phytoplankton for nutrition, and OCA may alter the nutritional value of phytoplankton (Rossoll et al., 2012). Phytoplankton exposed to OCA conditions may have different nutritional content, such as being low in essential polyunsaturated fatty acids (PUFAs), and these changes could impair the growth and development of grazers due to poor nutritional quality (Sargent et al., 1999; Sterner and Elser, 2002; Martin et al., 2008). In laboratory experiments, responses of phytoplankton growth rates to OCA appear to be species-specific and include increases, decreases, or no significant change to growth rates. In a series of experiments with phytoplankton species commonly found in the New England/Nova Scotia region, there was generally no change in growth rates between present-day and year 2100 predicted CO2 levels (750–1,000 μatm; Andrew King, Norwegian Institute for Water Research, pers. comm., August 30, 2014). Phytoplankton cultures grown at high CO2 levels generally show either no change or approximately 10–40% higher C:P and N:P molar ratios (Hutchins et al., 2009). Several species from the NECAN region reflect this pattern, with diatoms not exhibiting a significant change in C:P and N:P molar ratios when grown at elevated CO2 levels. Several species, however, had significantly lower C:P and higher N:P ratios when grown at extremely high CO2 levels (~3,000–4,000 μatm pCO2), and these levels may occur in some coastal acidification episodes. Relatively little is known about the influence of CO2 on essential PUFAs that are synthesized by phytoplankton. Elevated CO2 levels (750–1,000 μatm pCO2,sw) were shown to result in an approximately 50% decrease in nutritious PUFAs in a diatom species (Rossoll et al., 2012) and a slight increase (approximately 5%) in PUFAs in a natural assemblage from Norway (Leu et al., 2013).